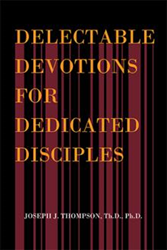 Inspired by his faith in Jesus Christ and driven by his desire to share its uniqueness, Joseph J. Thompson, Th.D., Ph.D., penned “Delectable Devotions for Dedicated Disciples” (published by Xlibris), a book about the devotional ascent or the purpose of experiencing a consistent love life with the Savior. “The one book that describes human history is known as the Judeo–Christian Bible. In it, explain what the Supreme Creator expects from all societies on earth. My book is only a compilation of Sacred Scriptures of discussing His love, grace, mercy, peace, etc., to encourage its readers,” Thompson elucidates. According to Thompson, the book endorses how God deals with humankind using several characters and shows how people are alike and different in ways. Also, it teaches how to use the practice of acrostics as another method in learning. Ultimately, Thompson hopes that through the book, readers will gain a Christian-worldview of LOVE (Loyalty Offers Visible Evidence) to their neighbors. “May this devotional guide and bless you as it has already done for me and many others who shared in its preparation,” he concludes. Readers may visit https://www.xlibris.com/Bookstore/BookDetail.aspx?BookId=SKU-001184435 to purchase and to learn more about the book. By Joseph J. Thompson, Th.D., Ph.D.